It is my sad duty as the webmaster of this website I launched 18 years ago at as a junior at Mississinewa High School. When I launched what is now AvaZinn.com as a my duty to inform, entertain my fellow Ole Miss grads on November 1, 1999, I had a mission as a first as a journalist to report the news. Today, as I had just finished an obligation to a commitment, news comes from Gas City about my fellow Class of 2001 alumnus Aron Wilson. Were that is wasn’t. 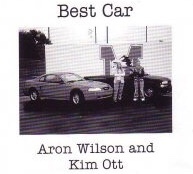 My memories of Aron were if they serve me right, was on the football and basketball teams while at Mississinewa High School as well as having the best car (photo posted here) with Kimberly (Ott). As a fellow MHS 2001 graduate, Wilson (if memory serves me right) brought the excitement of Mississinewa Football and Basketball into my life and I do occasionally wear the Mississinewa attire when appropriate or when I make a bike trip to Gas City (something I’ve done over the years since I’ve graduated with Aron). Wilson left an indelible mark on Mississinewa sports history as during the Homecoming Game (if I recall) senior year of high school was then- the first Homecoming win in 6 years beating Elwood (if I remember correctly). A graduate of Mississinewa High School in Gas City, he entered the the United States Air Force and served in tours in Aghanastan and Iraq. He is survived by his wife, Tara, a sister, two sons and their families. Additional survivors include his parents, many aunts, uncles, cousins. Private and a celebration of life services for Aron are planned for November 11, 2017 at Needham-Storey-Wapner Funeral Chapel in Gas City. In lieu of flowers, memorial contributions can be made to Aron’s children. An account has been set up for them at any Chase Bank. As for yours truly, I decided not to attend either the visitation or funeral due to a previous commitment. What I will do instead is send a condolence card to Tara Wilson as many of my fellow Ole Miss Class of 2001 alums will be there. I, Ava Zinn, am saddened to learn about the passing of my fellow Mississinewa High School Class of 2001 alumnus, Sergeant Aron Wilson. Aron brought Mississinewa High School Sports into the lives of my daughters (Samantha, Tiffani, and Tabitha) and my family’s lives, especially with my memory of Aron on the basketball and football teams. I still remember during the senior year with Aron that Ole Miss won its Homecoming game for what was at the time its first win in six years. My thoughts and prayers are with Tara and Aron’s children. Although I will not be able to attend Aron’s visitation or funeral due to a previous commitment, posting my condolences is the best option.